Opening the doors of a new business can be an exciting but busy time for all new business owners. This process usually involves spending money installing assets and fitting out the new space appropriately in order to suit your needs. One of the ways new business owners may be able to recoup some of their initial start-up costs is by making sure they are maximising their depreciation claim. Depreciation deductions are available for all types of commercial properties for the wear and tear that occurs to the structure of the property and the items it contains. Unlike residential properties, both owners and tenants can claim depreciation deductions. The owner can claim the building structure and any plant and equipment assets already found in the building, while the tenant can claim any assets they own or contribute from the start of their lease. Below is an example of how one tenant was helped to generate additional cash flow for a medium sized café simply by claiming depreciation. As the premises had previously already been established as a café, most of the usual fixtures and fittings were already in place and the tenant only needed to add a few additional items before the business was ready to open. After hearing about the benefits of depreciation from Mitchell Partners, the tenant arranged a BMT Tax Depreciation Schedule. 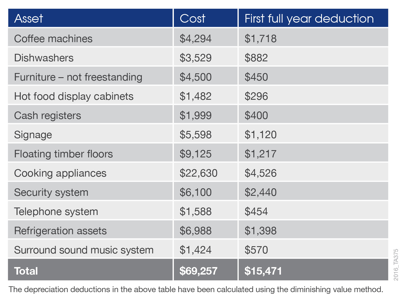 The table below provides a summary of the items the tenant installed, their cost and the first full year depreciation deductions that were claimable. As the example shows, the tenant was able to claim $15,471 in deductions for the first full financial year for assets installed during the fit out of the café. The additional cash flow from depreciation helped the tenant to recoup some of the costs incurred during the start-up phase of the business. Separate comprehensive tax depreciation schedules are recommended for the property owner and tenants to help both parties to maximise their depreciation claims. Please contact Mitchell Partners on 03 9895 9333 or visit us at http://www.mitchell.com.au/ to find out how depreciation may benefit your business.